Members of the National Democratic Congress have demonstrated their commitment to ensure that Princess Royal Hospital in Carriacou is equipped with the necessary medication and equipment in order to administer a more professional service to its patients — following a two-fold visit to the institution last week Wednesday. The team of St George North-West Caretaker Ali Dowden; Caretaker for the Sister Isles, Randolph Fleary; Chairman, Tevin Andrew; Deputy Chairman, Wallace McLeod; and supporter, Linda Mathurine; first met with Acting Administrator at the hospital, Norland Cox, to better appreciate the needs of the institution and to offer suggestions in which they can render assistance. 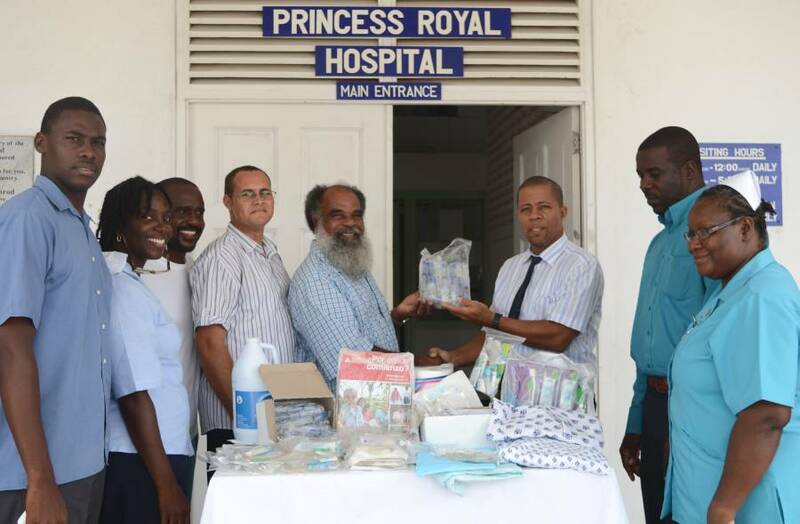 The team then handed over several medical supplies to Senator Jester Emmons and Mr Cox. Mr Dowden, who secured the medical supplies, said that as a responsible political organization, the National Democratic Congress remains concerned about the healthcare services on the sister isles of Carriacou and Petite Martinique, and the country as a whole. The package included intravenous lines, drip bags, needles, bed gowns, and baby holders, among other items. Both Senator Emmons and Cox thanked the NDC for the donation, and assured the donors that the items would go toward helping improve the delivery of services at the health institution. During the meeting, Mr Dowden said that concerns were tabled on the absence of resident dentist, need for a third doctor to be stationed on the island, fencing of the hospital property from stray animals, need for medical equipment, beds, and the challenge of human resources where a medical director is needed on the island. An X-ray machine, lab for blood testing and need for an incinerator, Dowden added, were also some of the issues they as a party would now be looking to address towards enhancing heath services for the sister isles.